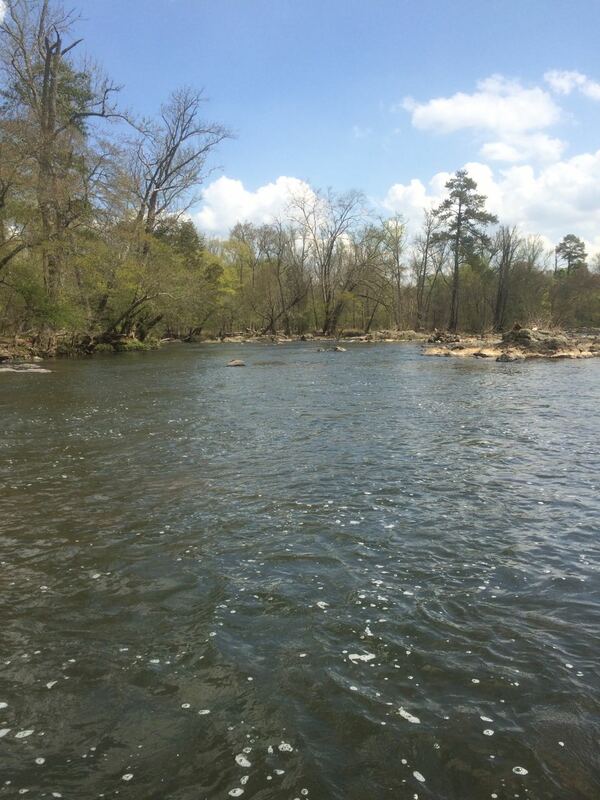 I practiced some defensive calendaring today (which is pretty bad for a retired dude, but the part-time job can create some schedule challenges 😉 ), marked off the afternoon, and drove about 20 miles from my house to where the Haw River runs into Jordan Lake (central NC). The spring weather was spectacular, with temperatures in the low 80’s and blue skies. It’s “yellow season” with the pine pollen every and spring busting out all over. 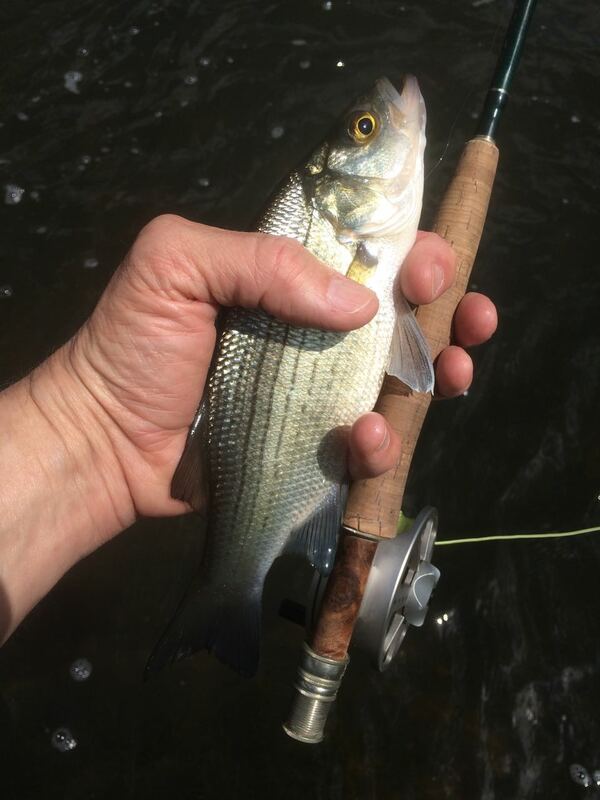 My goal was to catch some white bass on their spring spawning run up the river. I got to the Robeson Creek canoe landing about 1:30PM, after taking care of a few things in the “office” during the morning. I rigged up, and headed down the trail from the parking lot. I crossed Robeson Creek, and walked upstream past the end of the impoundment to the running water. There were a few fishermen around, mostly with buckets they were hoping to fill, and I walked upstream to a pool that had worked for me in the past. The water was pleasantly cool and perfect for wet wading. The water level was low, and the river was clear. If the water had been high or stained, this wouldn’t work, as the Haw is like wading on greasy bowling balls. It’s a big river, and if the water is up, it gets too deep pretty quickly. I cast a black sparkle wooly bugger a few times, but I wasn’t feeling the love with that fly. I put on a white Shenks’s streamer, and immediately hooked up with a nice little white bass. These guys can put quite a bend in the rod, especially when they leverage the current. 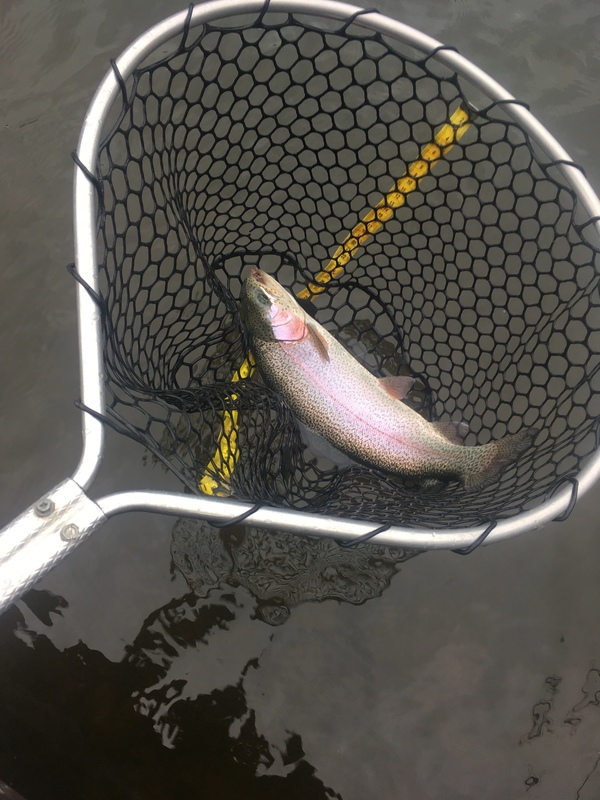 I fished for about two hours, an hour in one place, and then moving upstream to another spot for another hour. 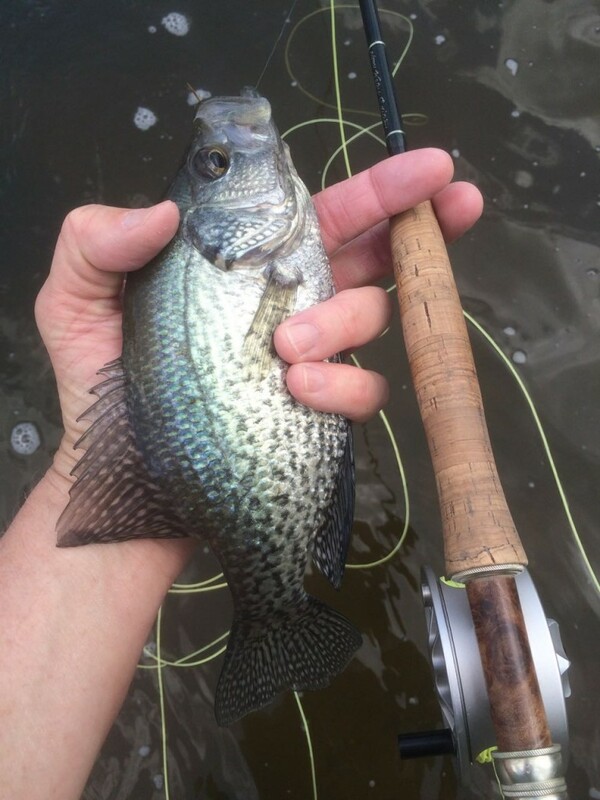 I caught about 15 white bass, several small largemouth bass, a few sunfish, and one nice black crappie (below). 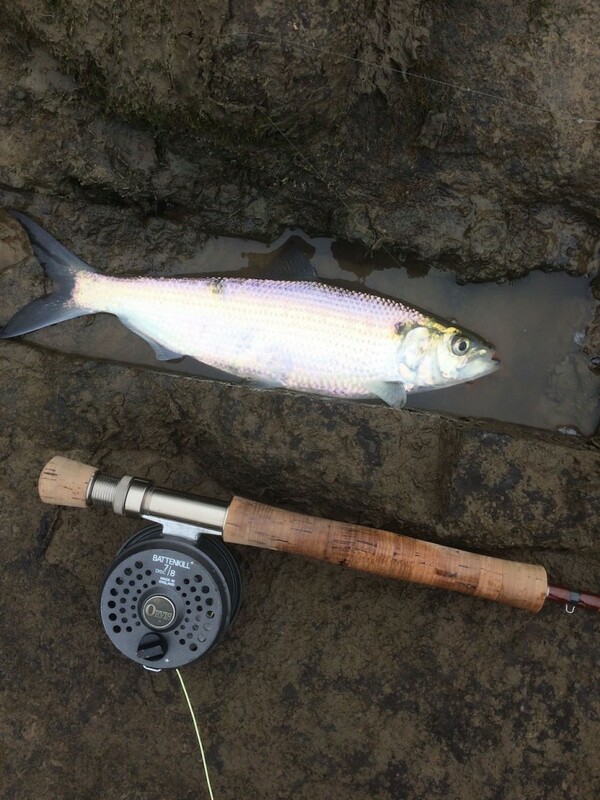 All fish were on the same white Shenk’s streamer. All the white bass were medium-sized males. I didn’t see any of the larger females; they’ve not come up the river yet. 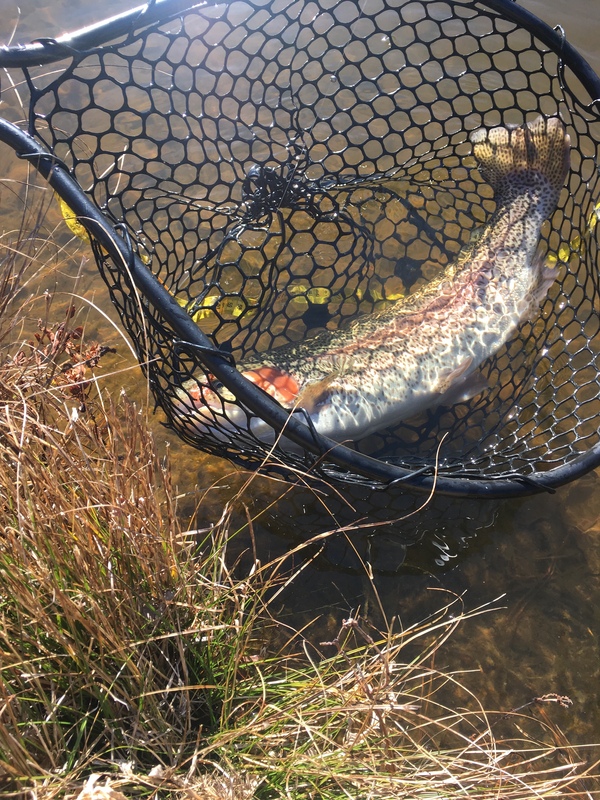 About 4PM, I decided I’d had a great day, the bite had slowed, and I headed for shore and the trail back. Got back home before 5PM, in time to sit on the porch with my wife and a glass of wine. Not a bad day! 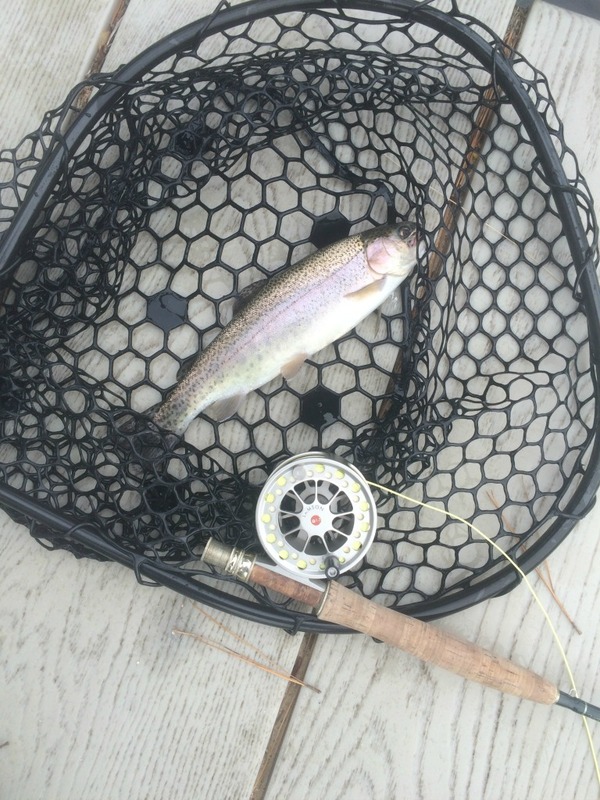 This entry was posted in Flyfishing on April 8, 2015 by joel. Two days of fishing in the last three? Wow! 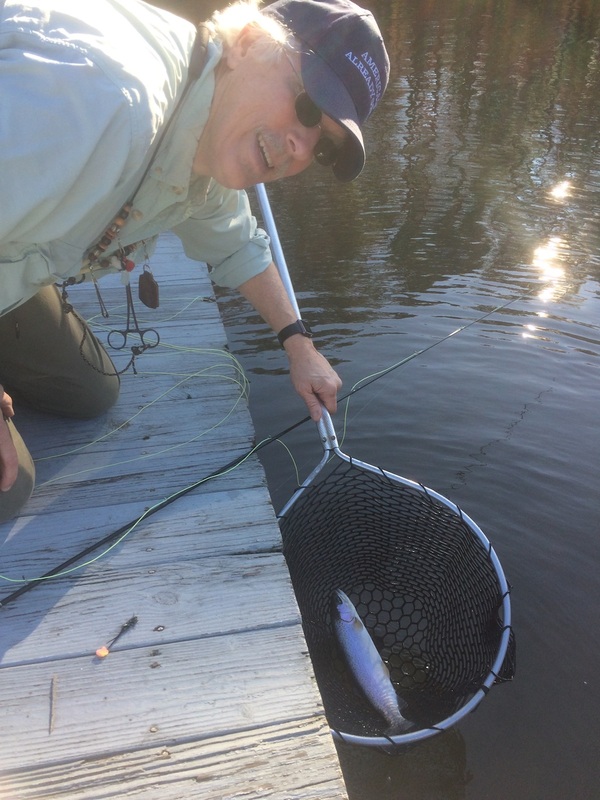 Sam and I met at Camp Clearwater today to try for winter-stocked trout (too warm here in the NC piedmont for a natural population). This is such civilized fishing. Leisurely morning at home, walk the dogs, breakfast with the wife, newspaper, coffee, and then drive less than 15 minutes to get there. Since the gate opens at 9AM and there were only 6 rods scheduled, no need to rush 🙂 . I met Sam in the parking lot at ~9:20 and compared notes on flies to try. The last time we’d ben out, the key was small midges (#18 or #20) as droppers below a dry as an indicator, primarily. We decided we’d stick with that, and the telemetry from the Lake Master was that this would be effective. It worked, but was slow, technical fishing. 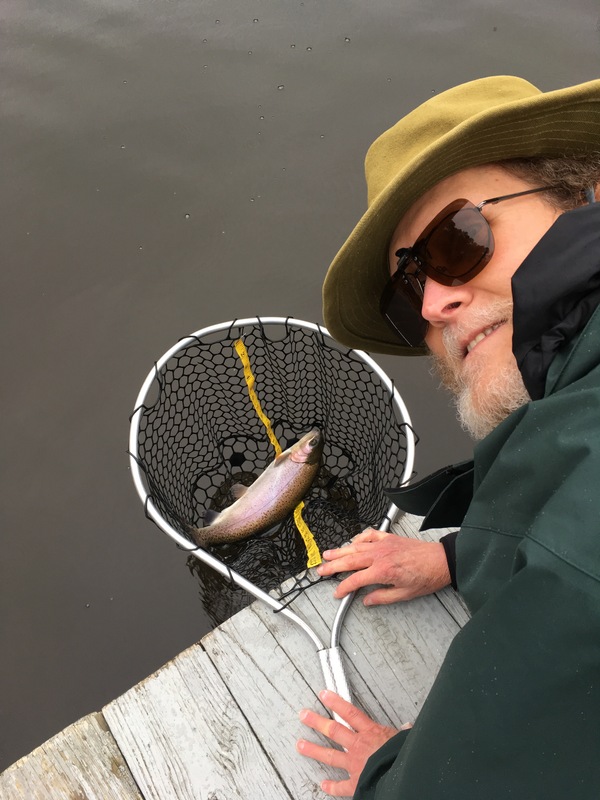 Trout were madly jumping all over the lake, sometimes hitting the dry indicator, most times nudging the dropper, but were devilishly hard to hook, especially on long casts, and then hard to keep on the hook. I managed to land several over the course of the day, most hitting a “Sweet Thang” tied by Sam, a tiny #20 bead head with a brown wire-wrapped body. Hell, I can hardly see ’em much less tie ’em! 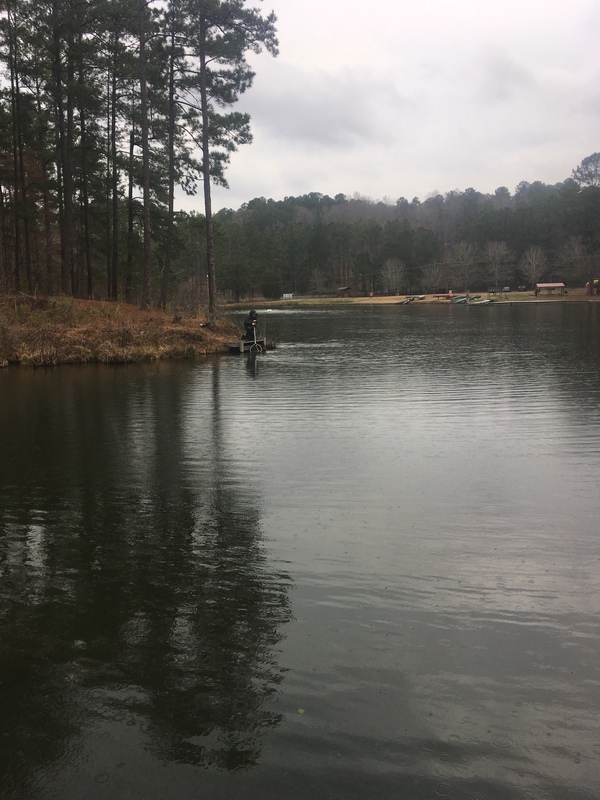 At one point, Sam and I were casting from a long dock, with another angler between us. We were both catching fish, and he was getting skunked. Sam passed him a Sweet Thang and he got two in short order. Keeping with the osprey theme from my post last Friday, as we stood on the dock, we watched an osprey grab a trout from lake and head to a nearby tree. It hit the water with a giant splash and I first thought a mondo trout had jumped until I saw the osprey. I caught a few on my dry indicator, a #16 CDC emerger, but mostly, they’d clobber it but miss the hookup. It was a nice day, pleasantly warm, in contrast to our recent chilly weather. Nice fellowship with our fellow fishermen and the Lake Master. A good way to spend the day. 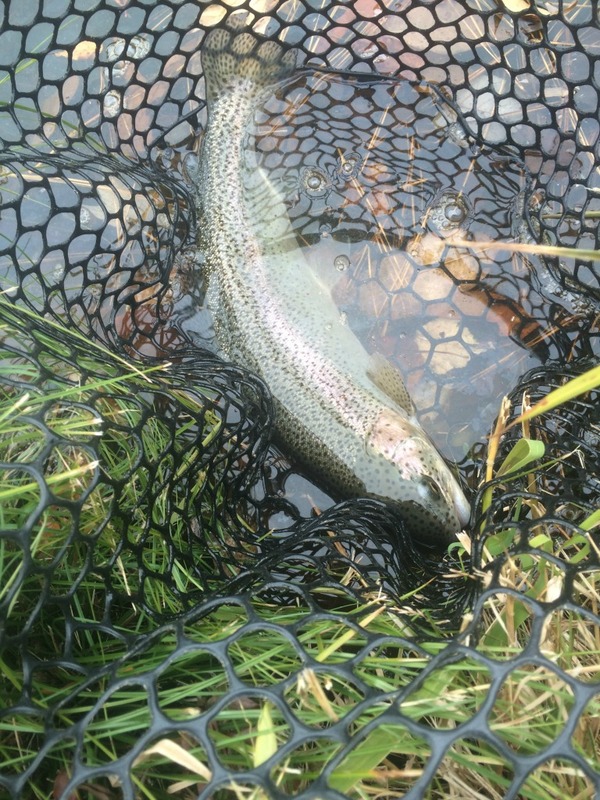 This entry was posted in Flyfishing on March 22, 2015 by joel. St. Patrick’s Day, this past Tuesday, was beautiful with blue skies and temperatures in the upper 70’s. Was that the day that I made my annual trek to Weldon for the shad run? Nope! Sam and I waited until Friday the 20th, with temps starting in the 30’s and topping out about 50, with some drizzle and thick clouds. However, it was the best day for the two of us to get together so we loaded up the canoe on the old red truck for the 2 hour trip. We didn’t rush due to the cold and rain…rain which was pulling out to the northeast. We timed our drive well, and the rain was finished by the time we arrived. We paddled across the river to our usual spot, but things didn’t look too promising, as we were virtually the only folks at the landing — never a good sign with something like the shad run, where people fishing means the fish are in. However, onward! We beached the canoe and clambered over the rocks to the top of the “Little River,” where the flow splits 90/10, with the small flow being the “Little River.” The water was quite chilly (49F) as I wet-waded through crotch-deep water to our favorite fishing rocks 🙂 . Invigorating! Well, to say fishing was slow was an understatement. 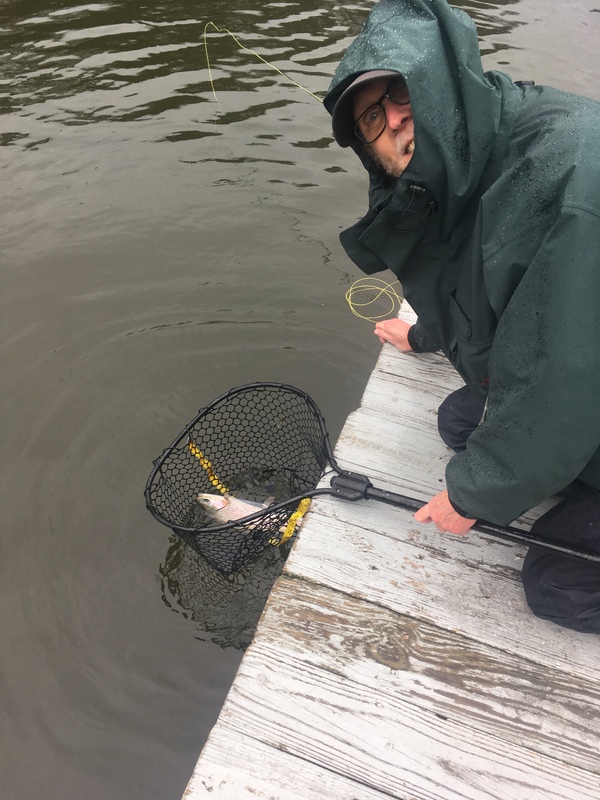 However, I did manage a half dozen Hickory Shad, and besides, the camaraderie made the trip worthwhile, regardless of what we caught. 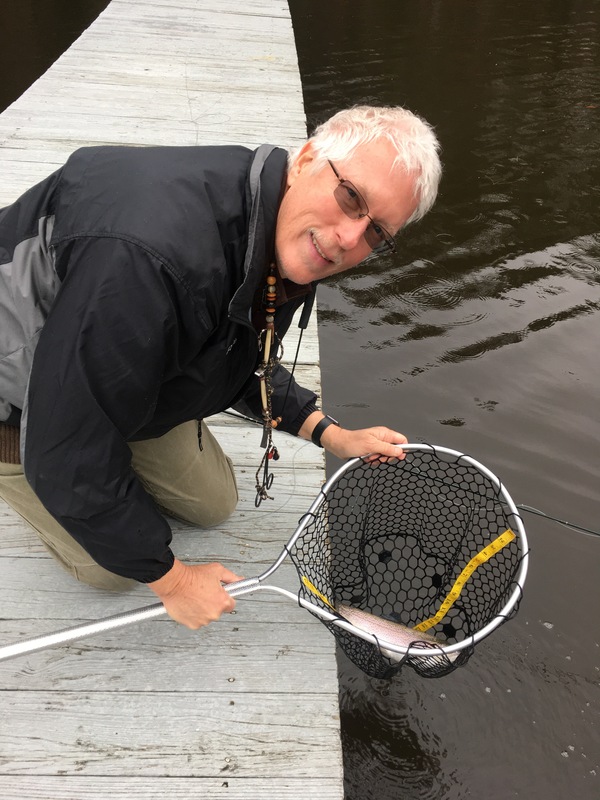 All the fish I caught were on a single orange fly…orange chenille body, orange bucktail wing, with some gold crystal flash added for good measure. This particular fly had bead chain eyes rather than the weighted eyes I usually use, and that may have made a difference but I think it really was more just putting the fly in front of a fish, and I had a better day of that than Sam. We saw a number of ospreys during the day, mostly as fishless as us 🙂 but one did catch a fish just a bit down the river from us, and it flew into a nearby tree to eat the shad while we fished. 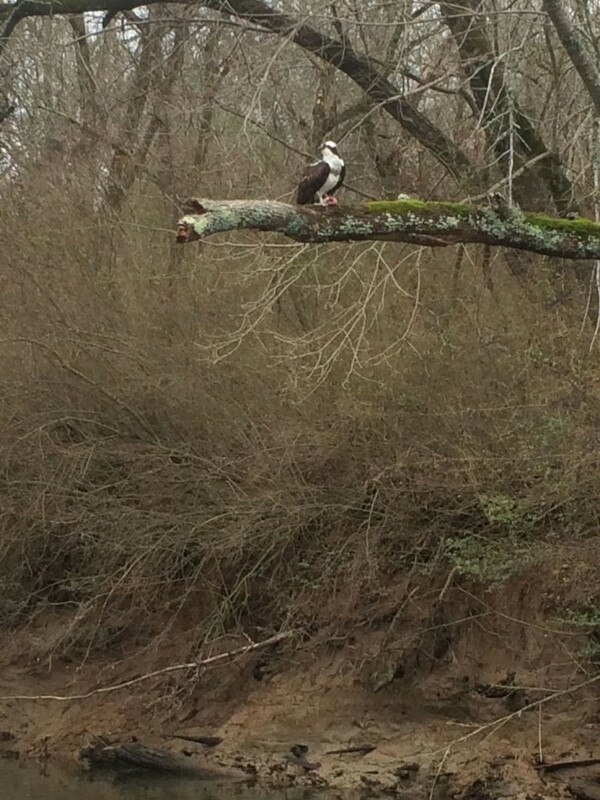 We also saw a bald eagle, also clutching a shad, on the far side of the river. In the past, we’ve seen wild turkeys fly by, but none today. All in all, a great day of fishing, so-so catching, good bird watching, and great fellowship. 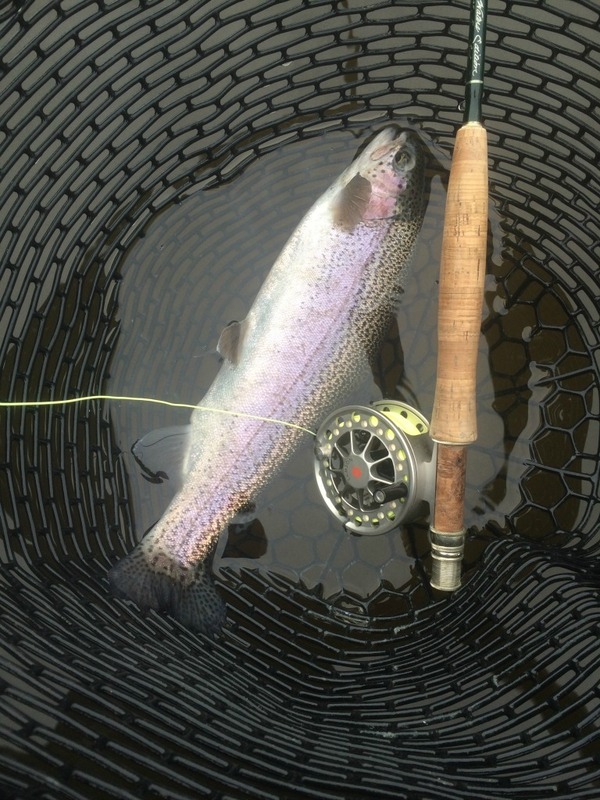 This entry was posted in Flyfishing on March 20, 2015 by joel. I spent a bit of time this weekend knocking a job off my digital “todo” list. Back last fall, the old Parallels virtual machine that ran the Flyfish listserver archives finally succumbed to old age. It was a very old instance of Red Hat Linux, but the virtual disk had become corrupt and would not stay up. I had copied all of the data, configurations and programs (WAIS/free-WAIS-sf) to my iMac, but had been procrastinating on trying to rebuild. I wanted to change Linux distros and I figured I’d probably have to re-make all the programs, and was “looking forward” to compatibility issues when I set it up. However, cold, nasty weather is good for hacking and not much else, so, I started the process. I decided to run a basic server installation of Debian. I didn’t want any of the GUI and it seemed that this was going to be one of the best platforms to grab a basic installation like this, plus I like Debian and the way the update and program installation work. I first played with it on the Raspberry Pi, which initially came out with a version of Debian. So, I downloaded the ‘Net install ISO (about 280MB), and created a VM. I then installed the packages I wanted, and set about installing the archive server. I have almost 25 years of postings to this listserver archived, so it took a few minutes to copy over all that “wisdom.” Then, the Wais configuration “source” files. Then…the binaries for the Wais programs…and they ran! Guess since I built it with gcc and the target was i386, there really weren’t any dependencies from the old platform. I did have to tweak one of my scripts that had a hard-coded path to the cgi-bin directory, which has moved out from under the var/www path under Debian to improve security. I’ve still got a bit of cleanup to do, including collecting and indexing the postings from 7/1/14 to the present, but that’s a simple task. The old thing took just a couple hours to set up. Check it out at archives.flyfishlist.org! 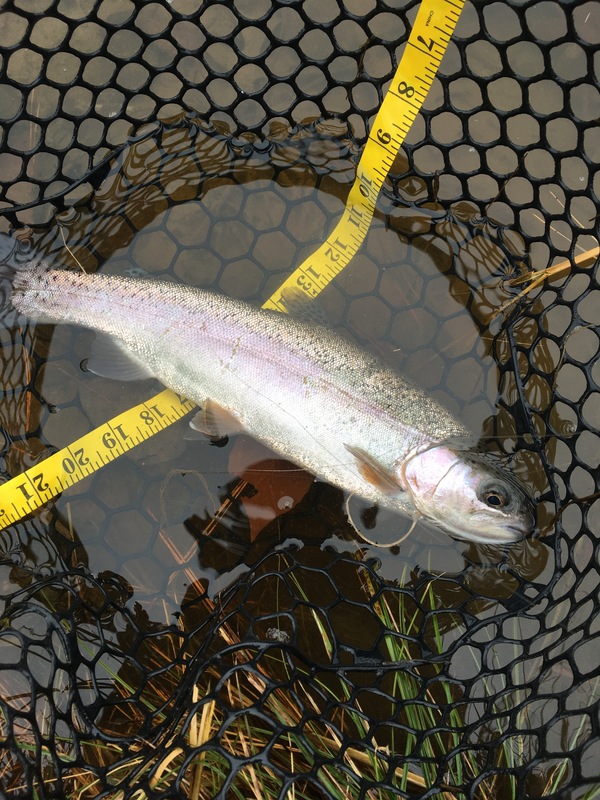 This entry was posted in Flyfishing, Technology on February 22, 2015 by joel. I had a chance to get away for a long weekend with my fishing buddy, Sam. 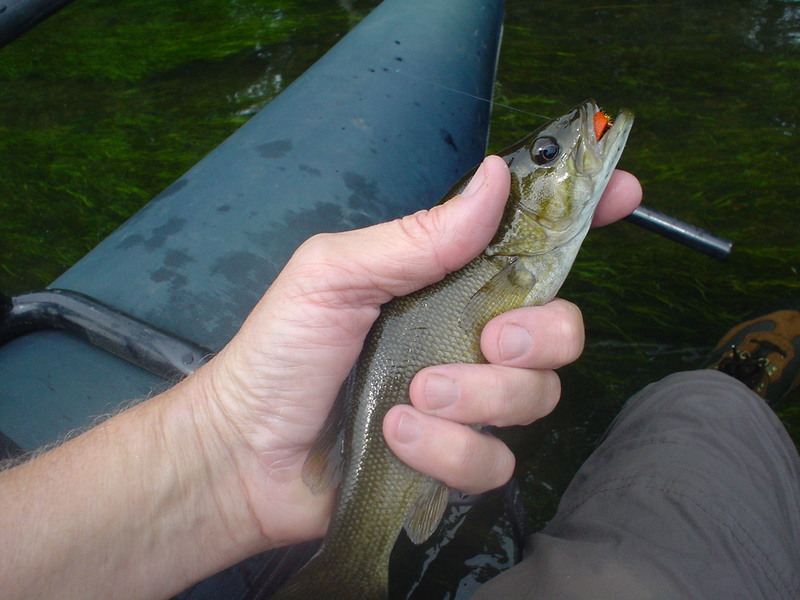 We needed a smallmouth bass trip, weighed our options and the weather, and headed to the South Fork of the Shenandoah. 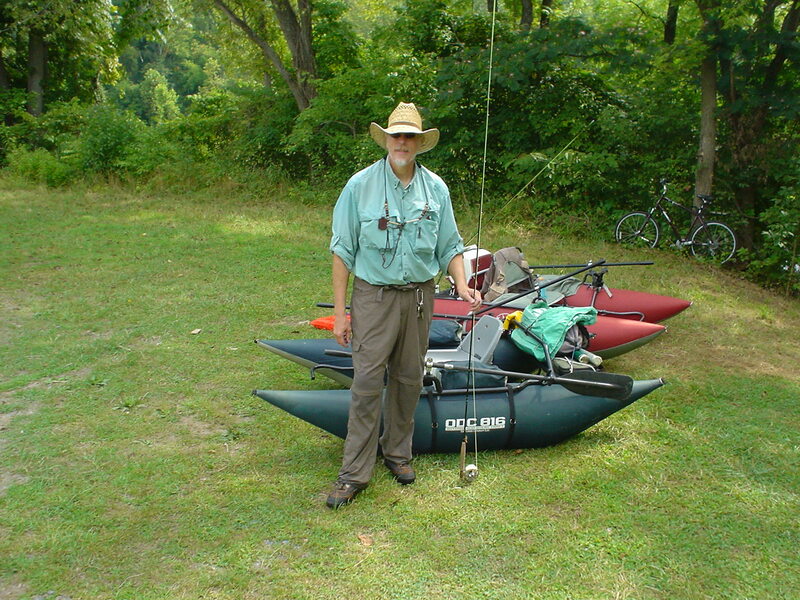 We’d decided to camp, and headed for the Shenandoah River Outfitters near Luray, VA. When we got there, they asked, “do you have reservations?” That’s always a bad sign. I’d checked their website and it was showing clear availability all month, even on the weekends. Seems that was not really the case. They said they could give us Thursday and Friday night, but not Saturday. Fortunately, they had a cancellation, and we ended up with a site for the entire weekend (plan B was a motel in Luray). It’s a decent place to camp, but it sure is kinda crazy on the weekend as they manage the tubers, canoeists, and rafters. I’d never seen a 36-canoe trailer before, but they have a couple of them! We got there in time to cook dinner and then go out to wade fish a bit before dark. We tried an access point a couple miles downriver from the camp. Sam caught a couple of bass, and I got a nice fallfish, on a popper, no less! As it got too dark to wade in fast water, we headed back to strategize about our float plan for Friday. We decided to float from Foster’s Landing to Seekford Landing, which is 5 miles. We used the trusty “bicycle shuttle” (me dropping off Sam at the upstream point with the boats, and leaving the truck at the takeout, and biking back. Saved a shuttle fee of about $50 😉 . Here’s a shot of me as we were ready to start out. I caught almost all of mine on a brown crayfish pattern. It was working for me, so why change a good thing? I was intrigued by the sunfish on the Shenandoah. They would hit in some very fast water, much more so than where I’m used to catching sunfish on a smallmouth river. When a fat sunnie gets sideways in current, you’ll think it’s a nice bass…except no jumps. For Saturday, we decided after considerable thought, to wade fish. Sam wanted to show me the area below the Luray powerplant, where he’d had good success in the past. We headed up first thing in the morning. The problem was that the water was quite cloudy. I think that it was from the water coming over the dam, stirring up sediment that had settled out by the time it got a mile or so downriver. Anyway, we couldn’t see our feet, which is not good, and decided to go downstream. 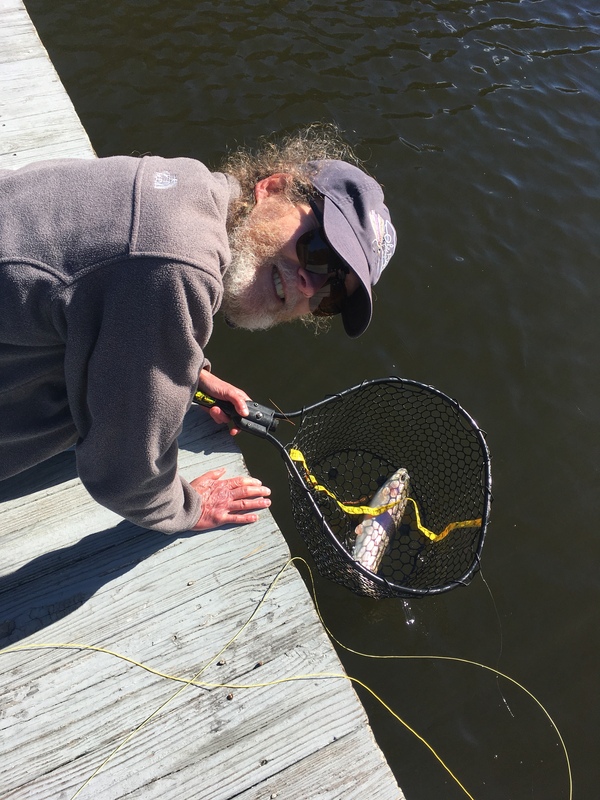 We fished Bixler’s Ferry access, Bealer’s Ferry access, Foster’s Landing and Seekford Landing. I did reasonably well, especially at Bealer’s. Sam didn’t connect on as many bass, but it was still a great day. One thing that was an issue for us both floating and wading was the amount of aquatic grass. Many areas were almost matted down with it, making the fishing tough. Sam had fished the Shenandoah before but didn’t remember the grass being as dense. 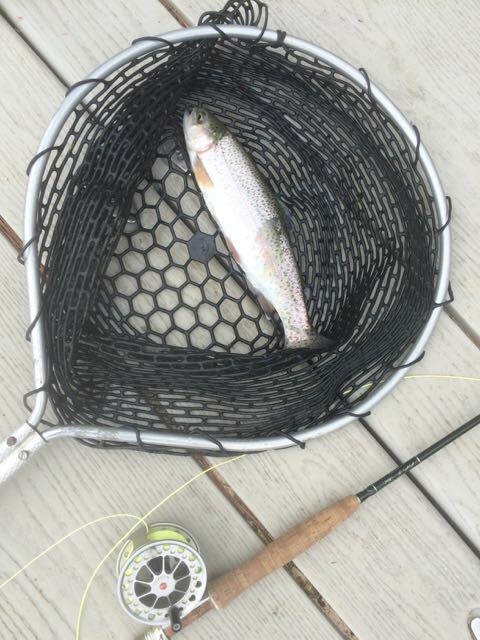 Maybe he was fishing earlier in the season. We weren’t sure. Anyway, it was a great weekend and good company. Sunday, we both needed to get back home so we packed up and drove the 4.5 hours back to central NC. Already looking forward to the next time I get a smallmouth on my line! 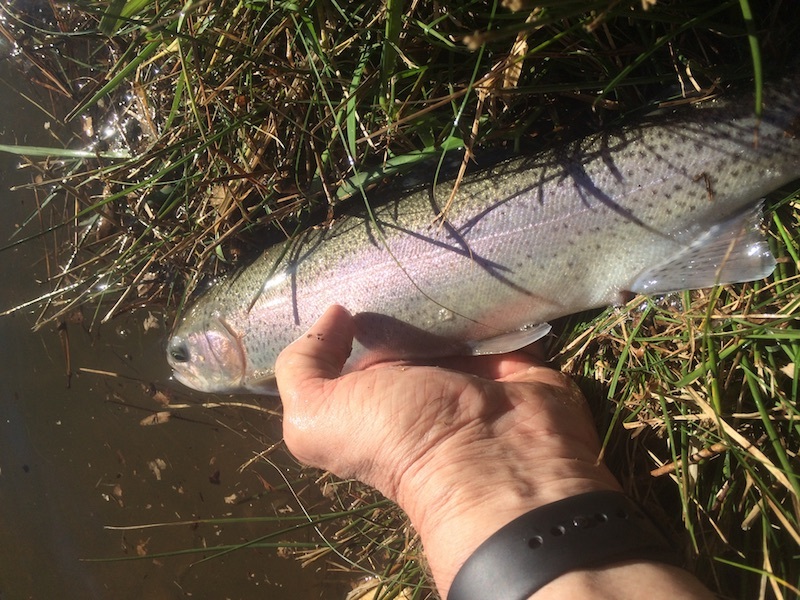 This entry was posted in Flyfishing on August 10, 2014 by joel.